Why is Gopastami celebrated ? Gopastami is a festival occurs on the eighth day of the bright fortnight in the month of Karttika. On this day, as Krsna entered the pauganda age he was initiated as a cowherder. Normally the pauganda age begins as a child enters his sixth year. Five years are allotted for youth (kumara), five years for boyhood (pauganda), and on the eleventh year adolescence begins (kisore). However, Krsna, being an extraordinary child in every way, passed through these ages quickly such that by the time he was seven he had entered adolescence. Even in ordinary human society we find that some children are mature for their age, and Krsna was such that he was one and one half times as mature as his actual age. At four, he was six years in terms of maturity. Soon after Krsna began walking, it was decided by the elders that the community of cowherds should move to Vrindavana, vanam vrndavanam nama. . .tat tatradyaiva yasyamah. Once in Vrindavana Krsna soon developed the desire to herd the calves. Before he was initiated into cowherding, he was initiated into calf herding. This is first mentioned in the Bhagavata in connection with Krsna’s killing Vatsasura, sva kalena vatsa-palau babhuvatuh. At this time Krsna had left his mother’s breast and his curiosity increased. He was in the final portion of infancy, sesa kumara. 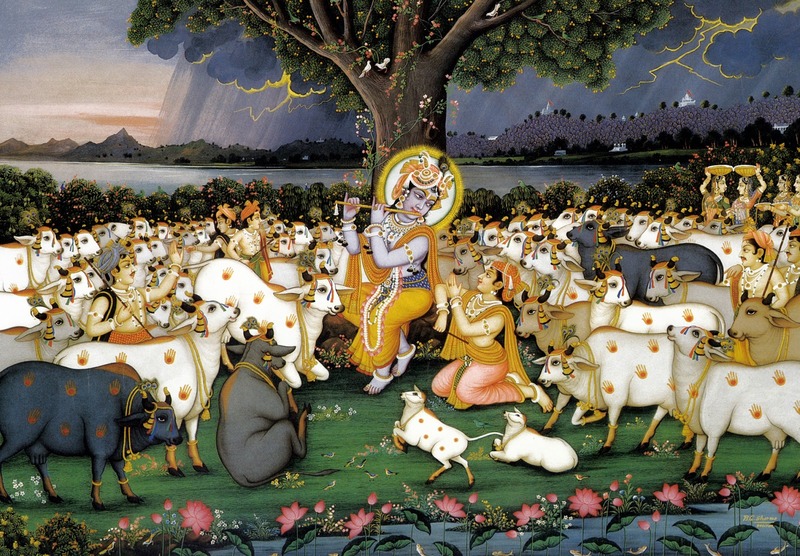 When Nanda Maharaja would go to the forest to herd cows, Krsna would go along with him. They would play at cowherding themselves, and when this news reached Yasoda, she chastised Nanda Baba, thinking her son to be too young to be grabbing the horns of bulls and cows. Her motherly affection did not allow her to see that Krsna was actually growing literally and growing within in terms of his dharma or nature. What was Krsna’s dharma? Herding cows, surabhir abhipalayantam. When mother Yasoda tried to restrain him, he stole away and mixed with the older boys who were already in charge of the calves. After all, it is difficult to change one’s nature. This, however, is our task as sadhakas, to retire our nature born of material identification and awaken to our eternal nature, sva dharma. We are to awaken to paro dharma, that which is ahaituky apratihata yayatma suprasidati. This is Krsna dharma. Ahaituky means without cause. This dharma is not a product of the world of cause and effect. In this sense it has no beginning, as it belongs to the timeless realm. Accordingly it is without end, apratihata. Nothing can stop it, and those involved in it will stop at nothing to satisfy the supreme atma, yayatma suprasidati. His satisfaction is the criterion for successful action. In Vrindavana, this principal guides all movement. This is real dharma, samsiddhir hari tosanam. That it would express itself as cowherding is appropriate, for herding cows represents the protection of innocence, and innocence is faultless even when faults appear. Our nature is faulty. We are prone to illusion. Even though we are by nature souls, we are defective and thus prone to our present condition. Our good fortune lies in the fact that Krsna’s nature is affectionate. By measure of affection he has been acknowledged as the highest conception of divinity, akhila rasamrita murti, raso vai sah. What could be more relevant to us in our search for Godhead? His nature is his svarupa sakti that comes to surround us and make us fit for entering the forest of love. His is not ordinary cowherding. It is his svarupa sakti facilitating the joy of the Absolute. During the Govardhan lila all of the Gods named him Govinda, he who gives pleasure to the cows. It is he who gives pleasure to the world (go) as well, a world governed by the senses. He does so by manifesting his eternal lila, initiating the opportunity for us to join him in aesthetic rapture. Such is his unrestrained love for all souls. When Yasodamayi realized that she could not restrain him, she and Nanda Maharaja reasoned that it would be best to allow Krsna to care for the young calves in the immediate vicinity of the village. Consulting with the other elders Nanda arranged for the initiation ceremony. From the tantrics he determined the proper time and with others he arranged for the appropriate mantras to be given. Krsna along with Rama and many other young lads were then given ropes, sticks, flutes, and horns to carry. However, when sandals were brought, Krsna rejected them! We should learn from this that we cannot go to Vrindavana with our shoes on. We must leave the dirt collected for endless lifetimes behind us, if we are to enter there. In innocence and spiritual purity of heart, fearless, barefoot, and care free having ceased from caring for our selfish interests we can approach Vrindavana. When our approach is proper, we will have no necessity to watch out for ourselves. Our mind will become Vrindavana, as Mahaprabhu said, mor man vrndavana. Vrindavana will embrace us and all will be provided automatically, accommodation at every step. When Krsna refused to wear shoes, the cows began to stomp their hooves and soften the ground to accommodate his tender soles, and the sharp stones melted in anticipation preparing the ground to receive his lotus feet. All these events preceded Gopastami, which took place during Krsna’s pauganda lila. Krsna’s pauganda lila commenced at the beginning of his fifth year. Although his kumara lila lasts only three years as opposed to the normal five, it nonetheless lasted for a full four years due Brahma’s intervention that caused Krsna’s friends to miss an entire year. For their sake Krsna continued his kumara lila for a fourth year. Because his kumara lila extended itself a full year, his pauganda lila lasted only two years. The speed with which the pauganda lila passed was also due in part to the enthusiasm of Krsna and his friends resulting from their reunion after one year of separation. The pauganda lila’s beginning and end are described in the fifteenth chapter of the Bhagavatam’s tenth canto, wherein Krsna killed Dhenukasura and first exchanged glances with the gopis. In this chapter, Krsna became a full cowherder on Gopastami, babhuvatus tau pasu-pala sammatau. As the pauganda lila began, Krsna refused to allow Yasoda to bathe him due to the onset of bashfulness that accompanies this age. Although she consoled herself by rationalizing his behavior as childishness, she knew in her heart that he was maturing. This caused her grief, for she could understand that soon he would insist upon herding cows. The consequences of this for Yasoda were grave: Her son would be in the forest for the entire day! Thus she avoided thinking about it for as long as she could. The wise and judicious Nanda Maharaja then consulted with his wife and together they decided to seek an auspicious day and time to hold the initiation ceremony through which Krsna would become a full-fledged cowherder. In the meantime, all of Nanda Maharaja’s cows refused to step one foot into the pasture without Krsna. Thus Nanada was forced to act without any further delay. For three days announcements were made to the beat of kettledrums everywhere throughout the settlement. All of the arrangements made belittled that which had been arranged previously in connection with Krsna’s calf herding initiation. This event should be envisioned as follows: Accompanied by musical instruments and singing, Krsna approached the cows and priests before him. He then greeted them by washing their feet, offering them praise, and feeding them sweet fodder from his hand. After the cows were quite satisfied, he bowed before them in respect. Then he satisfied the priests with gifts and came before his father with folded hands along with Balarama. Nanda baba then placed a jeweled cowherd’s staff in his son’s hand and Yasodamayi, the queen of Vraja, anointed Krsna’s forehead with tilak, saying “Rama you stay in front of Krsna; Subala you stay behind him; Sridam and Sudama stay by his side, and the rest of you gather around him, for he is you dear friend.” She did and said this while drenching her son and his friends with her tears of love. 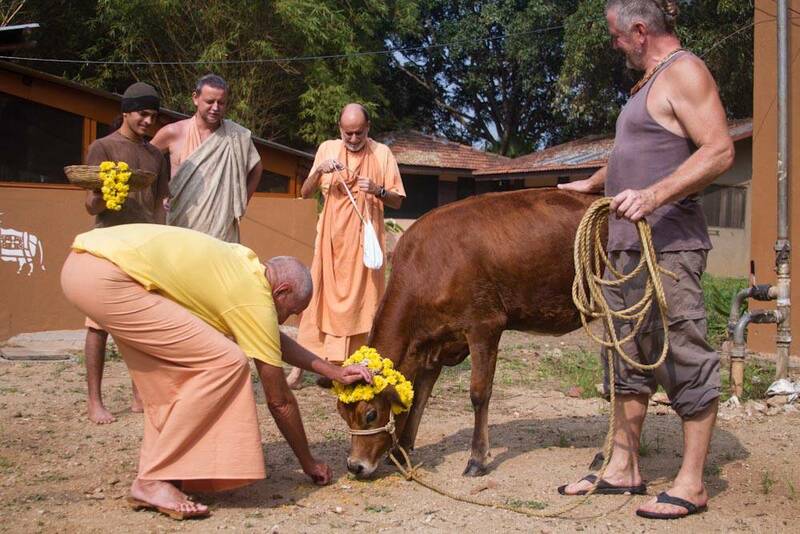 With the completion of the ceremony, Rama and Krsna called to the cows, hyah, hyah, jihi expecting the cows to move. Not prepared to move in front of him for fear of loosing sight of his beautiful form, they remained motionless until he went to the front of the herd and lead them into the forest. Even the gopis admit that to see this is the perfection of the eyes, aksanvatam phalam idam na param vidamah sakhyah pasun anuvivesyator vayasyaih. We can only imagine this scene, yet doing so with a pure mind we can enter there as well. Those interested in Krsna’s eternal friendship will hanker to herd cows with him through the initiation ceremony of Gopastami.